The 1991-built Bell 206B JetRanger III c/n 4160 was registered C-GADQ with Bell Helicopter before it was exported to Germany. 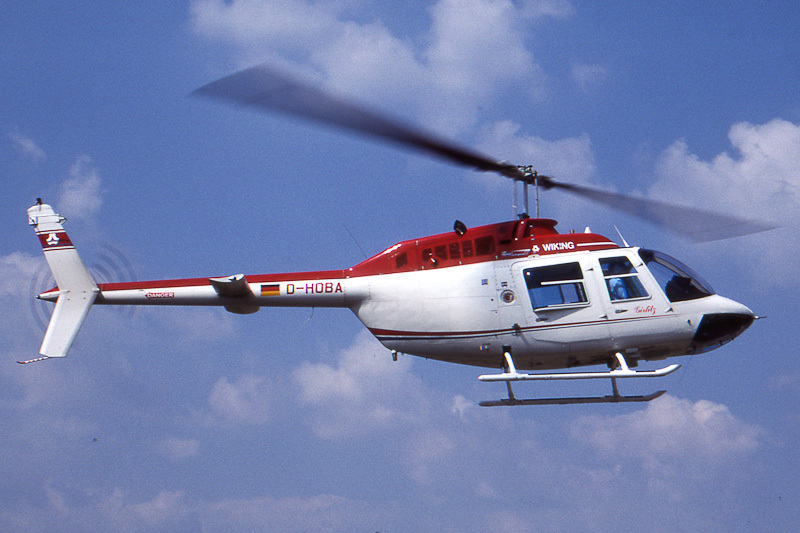 However in Germany registration D-HOBE was reserved, the Bell 206B JetRanger III entered the German register as D-HOBA with Wiking Helikopter Service GmbH, Wilhelmshaven, in May 1991. In service with Wiking, JetRanger III D-HOBA was christened "Girlils". Registration D-HOBA was cancelled in October 1997, and on 20 November 1997, the Bell 206B3 was registered N18EA in the USA with Edwards and Associates Inc., Bristol, Tennessee, a company specializing in helicopter sales, completions, maintenance and aftermarket accessories. On 10 December 1998, the JetRanger was registered G-BXPN in the UK with R and M International Ltd., Dereham. On 22 January 1998, the helicopter was re-registered G-ONYX and registered with D.C. Burgoyne and A.J. Burgoyne t/a Burgoyne Group, Hereford. First on 13 March 1998, registration N18EA was cancelled as exported to the UK. On 18 October 2000, Bell 206B JetRanger III G-ONYX was registered with N.C. Wheelright, Alcester, and on 21 April 2004, the next registered owner became Kenrye Developments Ltd., Dundalk, Republic of Ireland. On 11 September 2009, registration G-ONYX was cancelled by CAA after CofA expired on 30 July 2008.